"There was an overall sense of intimacy in this latest production that hasn’t been there for a few shows. I felt like we were all one big family celebrating, laughing, cringing, and all in on the joke. There’s a lot about the show that is consistent from year to year, but rather than feeling tired, it felt comforting." 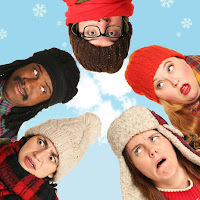 "BNW's current show The Polarizing Express blends the holidays and politics to provide an on-point critique and self-flagellation that will give you laughter therapy for days."